Top business leaders from international compounding companies will discuss key strategic issues facing different sectors of the market, including technical compounds, masterbatch, PVC and polyolefins at the Compounding World Expo 2018, to be held in Germany. Also, a line-up of panellists has been revealed for a series of free-to-attend debates at the expo 2018, which is being held in Essen, on June 27 and 28. The first debate will focus on the technical compounds sector and the panellists will include Heinrich Lingnau, who is senior vice president and general manager for Europe, Middle East and Africa at the leading global compounder, A Schulman. 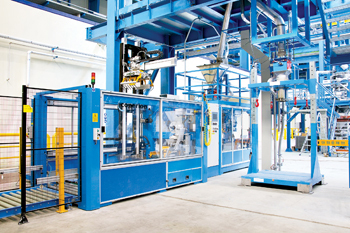 He will be joined by Bernd Sparenberg, vice president of the technical compounds business unit at Albis Plastic, the international plastics distributor and compounder which operates compounding plants in Germany, the UK, the US and China. Also on the panel will be Dr Oliver Frey, who is head of the compounding department at Ensinger, the German compounder focusing on compounds with special functions, such as electrical or thermal conductivity and tailored tribological properties. Providing a different perspective will be Dr Christof Krogmann, who is general manager of Kingfa’s European operations. Kingfa, which is headquartered in China, has grown to become one of the world’s largest compounders and opened its first plants in the USA and Germany in 2016. The future of the masterbatch industry will be covered in a debate on the second day of the expo. The influential panel will include Yves Carette, who is president and CEO of leading global masterbatch specialist Ampacet Corporation, which operates 24 manufacturing sites in 17 countries. Clariant, another leading name in the global compounding industry, will be represented by Marco Cenisio, senior vice president and general manager of the company’s Masterbatches Business Unit. Joining them on the panel will be Dr Martin Fabian, managing director of Lifocolor Farben, a major European producer with plants in Germany, Poland, the Czech Republic and France. One of the biggest names in compounding and masterbatch, PolyOne will be represented by Gary Fielding, who is the company’s global marketing director for colour, additives and inks. The issues facing the PVC compounding industry will be discussed on June 27, by a panel that will feature Yves Heroes, who is director of marketing at Kem One, a major player in the European vinyl industry. He will be joined by representatives from the PVC compounding sector, including Fernando Amaral, who is general manager of Portugal-based Automotive Compounding Industry and the Perplastic Group. The final expo debate on the afternoon of June 28, will focus on polyolefins, and will feature senior representatives from leading compounders of polypropylene. They will include Peter Torma, managing director of Inno-Comp, the major PP compounder with plants in Hungary and the Czech Republic. He will be joined by Massimo Veronelli, director of strategy and marketing at Sirmax, the Italian headquartered company that also operates facilities in Poland, Brazil and the US. In addition, the panel will feature Dr Adam Galambos, director of technology in Europe at Washington Penn Plastic Company, which has PP compounding plants in the USA, Mexico and the Czech Republic. Completing the panel will be Mikhail Katsevman, who is head of research and development at R&P Polyplastic, a leading Russian plastics compounder and a major produce r of PP compounds. The exhibition will feature more than 140 exhibitors and two conference theatres hosting technical presentations and educational seminars in addition to the strategic debates. Admission to the exhibition and the conferences is free-of-charge and attendees will also be able to visit the Plastics Recycling World Exhibition, which is taking place on the same dates in an adjacent hall at Messe Essen, it stated.